Dark circles refer to the discoloration of the skin under the eye, also known as dark shadows or dark rings. 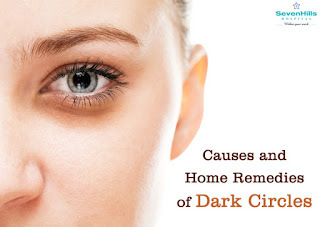 Dark circles are common in both, men and women. Though they are not a serious health problem, unlike many skin diseases, they surely can make people look tired or exhausted, older, and unhealthy. 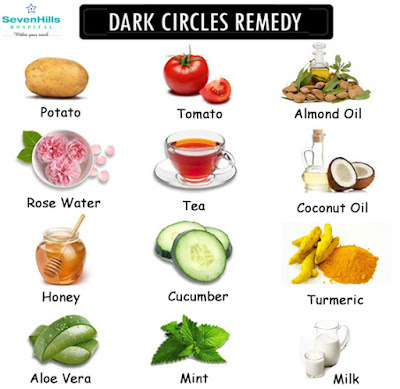 Using the below easily available items, you can get rid of dark circles at home. Here’s how to use them to your benefit. Raw Potato – Grate raw potatoes, extract the juice, soak a cotton ball in the juice, and place it over your closed eyelids for about 10-15 minutes. Rinse with water. Alternatively, you may slice the raw potato and place the slices on the affected area to get rid of the dark circles. Repeat once or twice daily until the circles are gone. Tomato – Apply a mixture of one teaspoon of tomato juice and one half teaspoon of lemon juice for about 10 minutes on the dark circles. Rinse it off with water. You can also use just the tomato juice until the circles are gone. Almond Oil – Gently massage a little almond oil over the dark circles and leave it on overnight. Wash it off with cold water the next morning. Repeat this daily until the circles are gone. Rose Water – Soak cotton balls in rose water and place them on closed eyelids for about 15 minutes. Repeat this twice daily until the circles are gone. Tea Bags – Refrigerate two used black or green tea bags for about 30 minutes. Place one over each eye and rest it for 10-15 minutes. Rinse when done. Do this once or twice daily until the circles are gone. Coconut Oil – Massage a little extra-virgin coconut oil on the affected area and leave it on for a few hours. Repeat this twice or thrice a day until the circles are gone. Honey – Apply a thin layer of honey on to the skin under the eyes. Leave it for about 20-30 minutes or overnight. Do this once daily until the circles are gone. Cucumber – Slice a fresh cucumber and refrigerate it for 30 minutes. Keep the slices on to the dark circle area for 10 minutes and wash it with water later. Do this twice a day until the circles are gone. Turmeric – Mix a little pineapple juice with two teaspoons of turmeric power and apply the paste, leaving it on the affected area for about 10 minutes. Wipe it then with a soft, damp cloth. Repeat daily until the circles are gone. Aloe Vera – Use the aloe vera gel and apply it under the eyes. Using the middle or pinky finger, gently tap the gel on to your skin under the eye. Leave it overnight daily until the circles are gone. Mint – Crush a few mint leaves and apply them for about 5 minutes. The tingling sensation caused by doing so helps in increasing the blood flow to the area, thereby causing the circles to fade away. Repeat this once daily until the circles are gone. Milk – Soak cotton balls in cold milk and place them under your eyes for about 10-15 minutes. Repeat this twice a day until the circles are gone. You can also use cold organic yogurt and follow the same. Lemon Juice – Soak a cotton ball in fresh lemon juice and place it over your closed eyelid for about 10 minutes. Rinse it off once done. Repeat this once daily until the circles are gone. Note: If using any of the above causes any burning sensation, then immediately discontinue using the same. This application of Apple that allows users to chat for long period of time skype to facetime We intend to be connected to our social circles as well as. ts 10th results 2018 If you are exploring across the web to get access to your AP Telangana class 10 and Intermediate results, you can make use of manabadi.com. The students can also get the result of various competitive and Government examinations directly from this website.